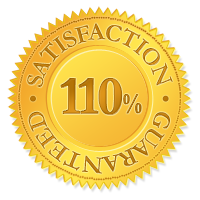 We're so confident you'll pass the exam, we're guaranteeing our product with a 110% money back guarantee! What this means is if you don't pass the exam after using our system, we will refund you everything you paid us, plus 10%! "Why 110%? Won't you lose money?" Yes, we will, but it is very rare for anyone to not pass after using our system. Therefore we're willing to take that risk and offer you peace of mind that you will pass the exam after using our system. Obtain at minimum a score of 80% in each category of the study guides. Complete at least 80% of each category of the study guides prior to your exam. Take your actual real estate exam no later than one month after the last usage of the study guides. If for some reason you do not pass the exam, send us a copy of your state's failure notice within 30 days, and we will refund 110% of your money. No questions asked. In compliance with the state of Florida law, guarantees as to the passing of the real estate exam are not offered nor applicable in Florida. © 2008-2019 Real Estate Exam Tutor.